Max, these weekly updates are great. The graphs are very straight forward and easy to read. Love those $/sf graphs. John Lockwood has permanently banned me for having pointed this out to him. Do you think it is dishonest to start your graphs of "flippers in trouble" at 60% rather than showing the y-axis all the way from 0-100%? 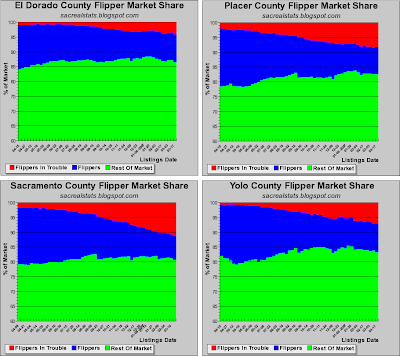 I think it misstates the data as for Sac County, it looks like Flippers in touble represent 25% of the market rather than the 10% that they actually represent. Also, why would you track "asking price" vs. "selling price"? This seems to be an odd metric. Also, do you think the high number of bank owned homes has anything to do with the decreasing price/ft^2 as I would assume these homes would not be as well maintained as one owned by an individual, not to mention the fact the owner obviously did not have any money to do upgrades, etc. Inventory is shaping up nicely. 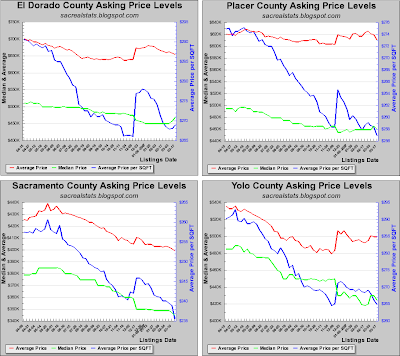 Regarding pricing in El Dorado County, what is going on there!? Max - or it could be that a lower median asking price means more lower priced homes are being listed, not that home prices were being lowered. Anony - never take a media graphic at first look - they are made to get your attention... example the price per foot vs price graph - the percentages are almost exactly the same, yet per foot change looks more dramatic. "Inventory is shaping up nicely. 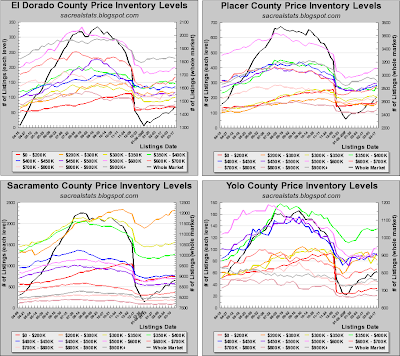 Regarding pricing in El Dorado County, what is going on there!?" Nothing. Statistical fluke based on low sample size. The prevailing trend is and will be down. 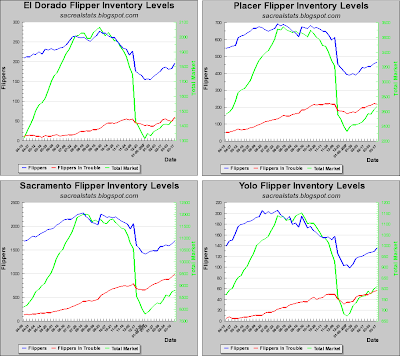 I've lived in many places in El Dorado County for many years (live there right now) and I can honestly tell you that inventory is sitting and the listings are increasing, the prices are dropping and there is a real sense of fear forming from the sellers I've talked to. This is not a good RE market at all and it appears to be getting much worse. Especially up the hill in Shingle Springs, Placerville, Camino, etc. there are a lot of very old for sale signs and a lot of reduced signs. Serrano also sux and there are literally rows of houses for sale on the same street. Anon 10:03 wants to know why you might track asking prices. Well, in this market, that is the most they will take for their house. They will probably take less....much less. The real point is this, asking prices are the leading indicator to selling prices, and you will soon see the result of lower asking prices. Do you think it is dishonest to start your graphs of "flippers in trouble" at 60% rather than showing the y-axis all the way from 0-100%? Not really. The point is to highlight changes in flipper market share. I think you need to give people more credit; if you were able to figure out what the graph represents, why can't everybody else? Also, why would you track "asking price" vs. "selling price"? Because that is the data I have. Selling price data are generated from a completely different data source. If you search this blog, you might find some. Any time you can get $/sqft graphs is a day with sunshine for me.